Our calibration equipment will analyze the performance of your faceting machine and its electrical components. The proper alignment of a machine and a machine’s ability to execute its functions correctly will directly impact the quality of your product and the efficiency of the operation. We are honored to have past Fac-Ette Manufacturing Inc. diagnostic technician Cindy Hine working with us to provide this service. 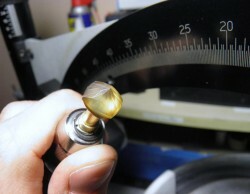 Calibration times can vary depending on the amount of work needed. Times can vary outside of the United States.